A lovely landscape brimming with family memories old and new. For most people, one garden would be enough. But not for Kathy Dubuque. 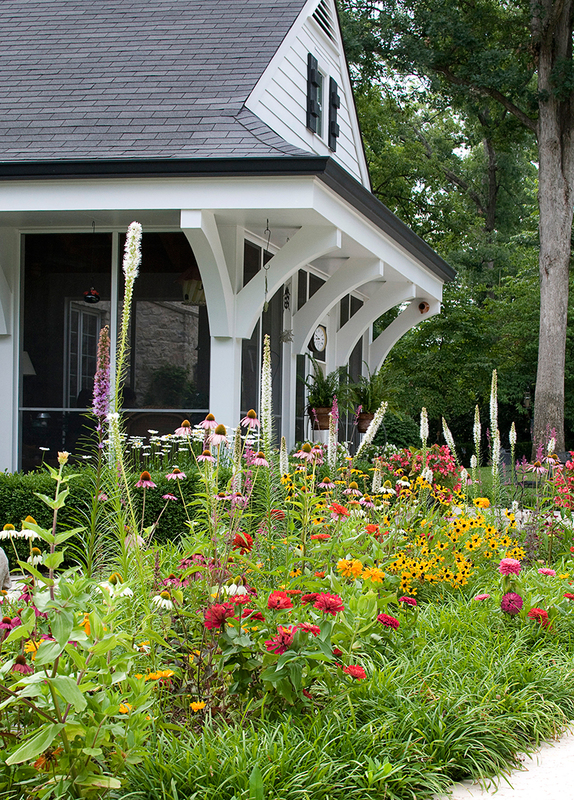 In the six years she and her husband John have lived in their Ladue residence, Kathy has created five or maybe six different gardens, depending upon how you count. 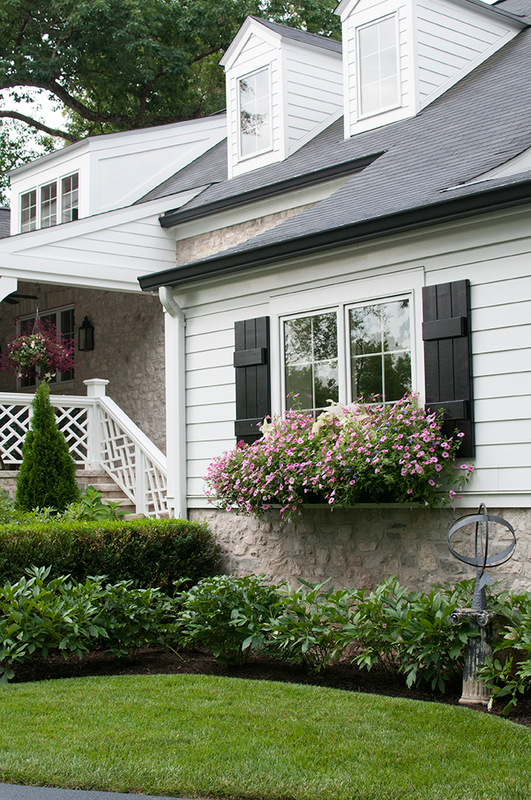 All surround the couple’s European, country-style home; all have their own personalities. In keeping with the charming, Old World look of the home, a courtyard garden, fenced by boxwood, filled with hydrangeas and highlighted by garden statuary, accents the front of the home. At the back, you have your choice. 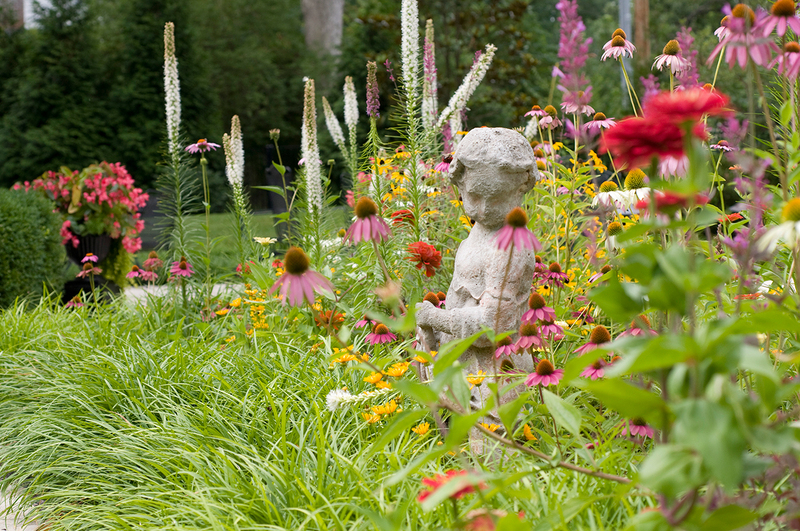 There is a sun-filled cutting garden overflowing with coneflowers, zinnias, snapdragons, liatris and phlox. Not only is it colorful and beautiful, it allows Kathy to cut bouquets for the house at a moment’s notice. A few steps away, just outside the back door, an herb and kitchen garden, literally ripe for the picking, flourishes. Filled with blueberries, strawberries, multiple tomato varieties, pole beans, sage, basil, chives and pots of mint, what’s for dinner is right at hand. Stroll past all the color, but still close to the house, and you’ll encounter a bit of leafy green serenity in a small water garden. Encompassing a water lily-filled pond and waterfall, the water garden is strategically located to bring the soothing, rippling sound of flowing water into the master bedroom. Nestled in the center of the yard, a free-form swimming pool beckons. It blends into the surrounding landscape via a collar of willowy liriope/monkey grass around the exterior edge of the pool deck. On the side away from the house, the liriope cleverly conceals a drainage area at the bottom of a slight hill. Just up that slope, Kathy’s shady, white garden literally glows. 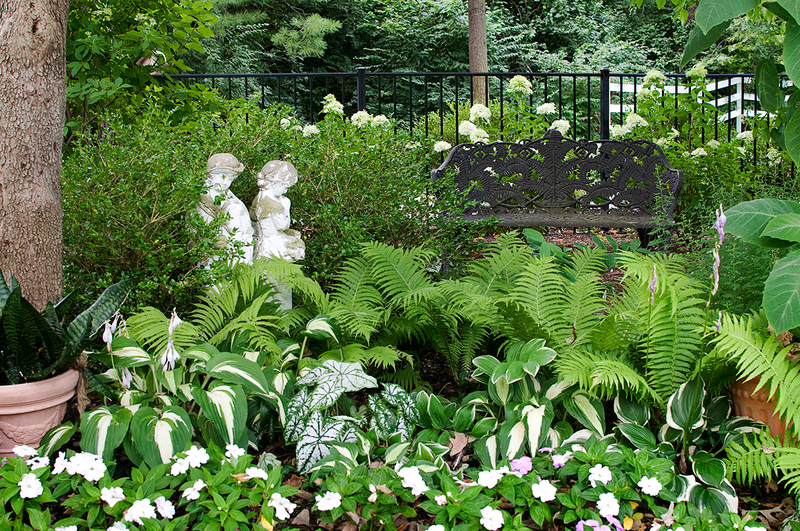 From the first dogwoods through frost, silver-leaved ’Jack Frost’ brunnera , white-striped hostas, white-leaved caladiums and white impatiens, all backed by feathery ferns, add light to the landscape even after dark. A flagstone walkway from the pool also provides access to Katy's cottage surrounded by boxwoods, rose of Sharon and five airy, multi-trunked, serviceberry trees. You would think those lush, beautifully planted areas would be enough for any home. But Kathy has one more special garden spot to peek into and it whispers its appeal to garden visitors of every age. 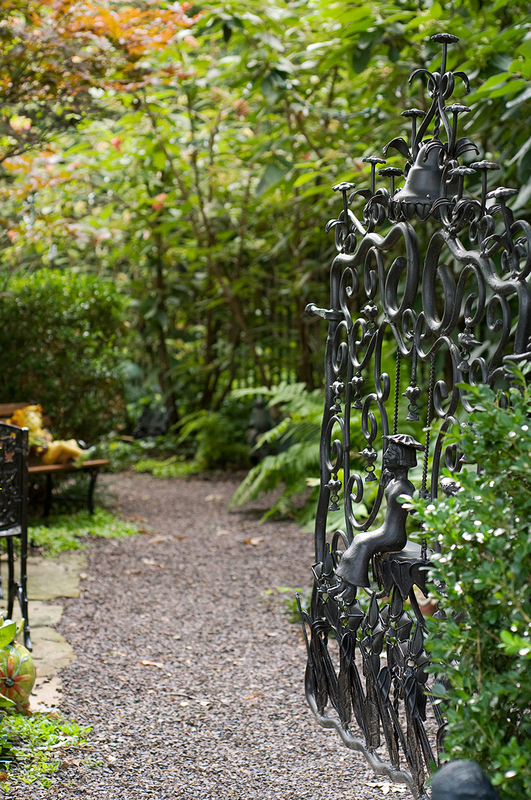 Tucked into the side yard, a small, ornate, wrought-iron gate hints that there is something behind it to explore. The wee fairy perched at the center of the gate offers a clue to the enchantment down the gravel pathway. Kathy can’t truly recall when her gardening genes came to the fore but the passion is definitely there. “I’m really self-taught,” she says. “And I’m lucky to have a lot of people who have helped me by giving me good advice.” Her own talents and her advice-giving friends succeeded so well that last year her garden was selected to be on the prestigious Missouri Botanical Garden tour of private gardens. “One of the people who came through the garden on the tour told me her earliest memory of me was when I was planting petunias outside of an apartment building in Richmond Heights,” Kathy recalls. 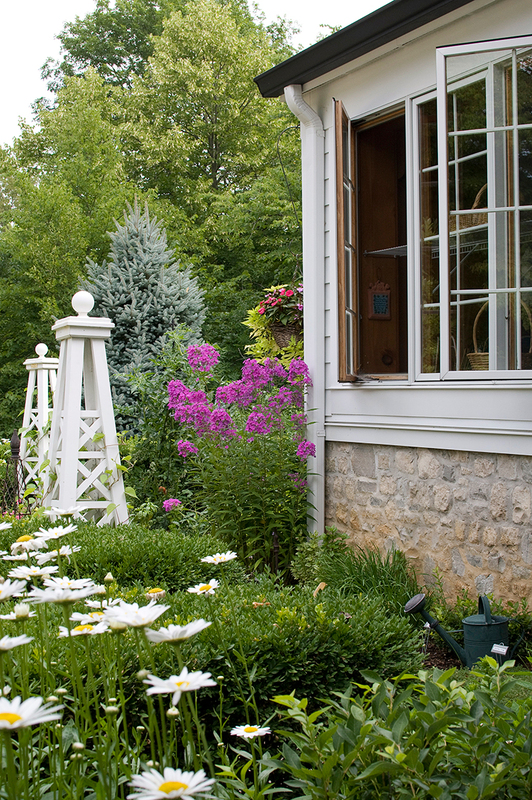 In addition to being beautiful, Kathy’s garden reflects the warmth of her personality and her love of family. Throughout the various spaces, objects from her family, her husband’s family and previous gardens accent the landscape. Among the boxwood and hydrangeas, a somewhat “persnickety” fountain featuring a flute-playing Pan and an armillary were both in the garden at a previous house. There are urns, tables and chairs and even an olive gathering pot with family history that have found their way into the various spaces. “It’s really a garden of gathered memories,” she says. 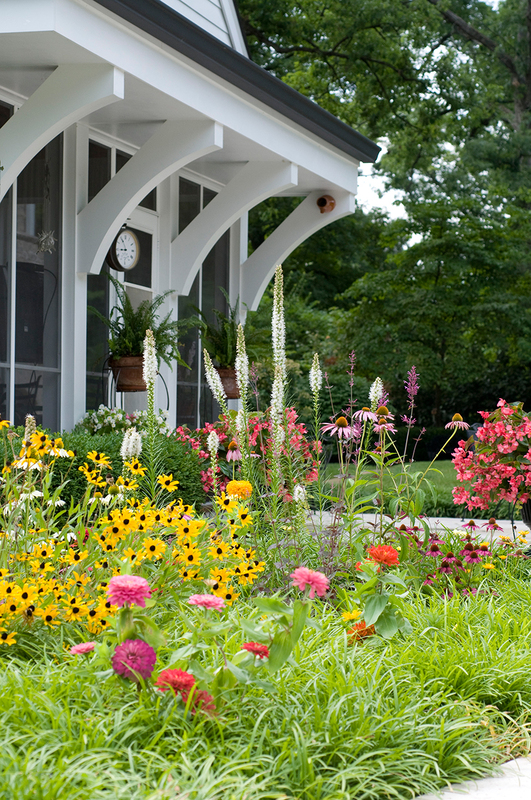 Also throughout the gardens are bird houses and bird-friendly plants and shrubs. 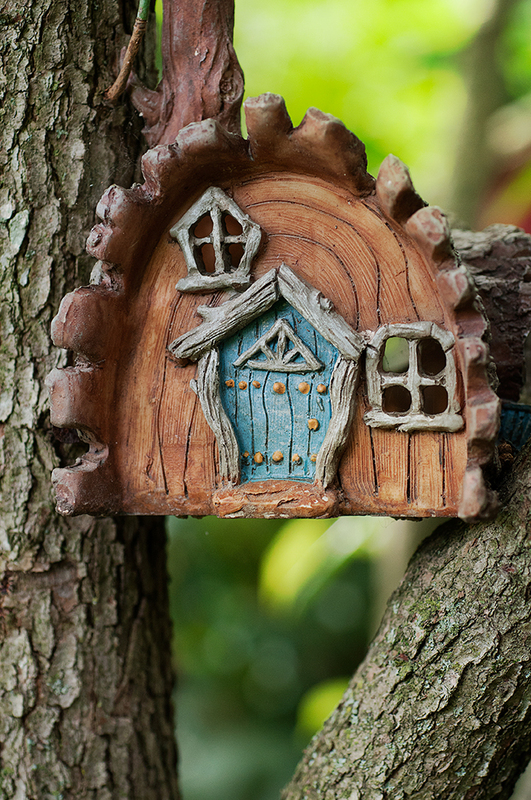 “Every single bird house has a bird family in it,” Kathy says proudly. As a testimonial to the hospitality offered to the feathered community, one bird left a calling card. Shortly after the Dubuques had sealed the driveway, a wild turkey strolled through the still wet sealant leaving foot prints on the front walk, which the couple has seen no reason to remove.